Liesbet Hooghe, Gary Marks, Tobias Lenz, Jeanine Bezuijen, Besir Ceka, and Svet Derderyan. 2017. 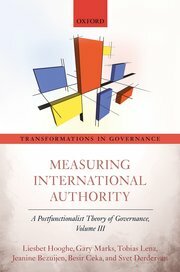 Measuring International Authority: A Postfunctionalist Theory of Governance, Vol. III. Oxford: Oxford University Press, xii+ 898pp. Aug 2017. This book sets out a measure of authority for seventy-six major international organizations (IOs) from 1950 to 2010. On the premise that transparency is key in the production of data, we chart a path in laying out the assumptions that underpin the measure. Successive chapters detail the authors’ theoretical, conceptual, and coding decisions. Profiles of regional, cross-regional, and global IOs explain how they are composed and how they make decisions. A distinctive feature of the Measure of International Authority (MIA) is that it breaks down the concept of international authority into discrete dimensions, which are built up from coherent ingredients—the composition and role of individual IO bodies at each stage in policy making, constitutional reform, the budget, financial compliance, membership accession, the suspension of members, and dispute settlement. These observations can be assembled—like Lego blocks—in diverse ways for diverse purposes. Liesbet Hooghe and Gary Marks. 2016. Community, Scale, and Regional Governance: A Postfunctionalist Theory of Governance, Vol. II. Oxford: Oxford University Press, 195pp. Published Aug 2016. The book argues that jurisdictional design is shaped by functional and communal pressures. Functional pressures arise from the character of the public goods provided by government: their scale economies, externalities, and informational asymmetries. However, to explain demands for self-rule one needs to understand how people think and act in relation to the communities they conceive themselves belonging. The authors demonstrate that scale and community explain basic features of governance, including the growth of multiple tiers over the past six decades; how jurisdictions are designed; why governance within the state has become differentiated; and the extent to which regions exert authority. Liesbet Hooghe, Gary Marks, Arjan H. Schakel, Sara Niedzwiecki, Sandra Chapman Osterkatz, and Sarah Shair-Rosenfield. 2016. Measuring Regional Authority: A Postfunctionalist Theory of Governance, Vol.I, with. Oxford: Oxford University Press, 687pp. This is the first of five ambitious volumes theorizing the structure of governance above and below the central state. This book sets out a measure of regional authority for 81 countries in North America, Europe, Latin America, Asia, and the Pacific from 1950 to 2010. Subnational authority is exercised by individual regions, and this measure is the first that takes individual regions as the unit of analysis. On the premise that transparency is a fundamental virtue in measurement, the authors chart a new path in laying out their theoretical, conceptual, and scoring decisions before the reader. The book also provides summaries of regional governance in 81 countries for scholars and students alike. Liesbet Hooghe, Gary Marks, Arjan H. Schakel 2010. The Rise of Regional Authority: A Comparative Study of 42 Democracies (1950-2006). London: Routledge, 224pp. This book measures and explains the formal authority of intermediate or regional government in 42 advanced democracies, including the 27 EU member states. It tracks regional authority on an annual basis from 1950 to 2006. The measure reveals wide variation both cross-sectionally and over time. The authors examine four influences – functional pressures, democratization, European integration, and identity – to explain regionalization over the past half-century. This unique and comprehensive volume will be a vital resource for students and scholars of comparative politics, public administration and public management, federalism, democratization, nationalism, and multilevel governance. Gary Marks and Marco R. Steenbergen (eds.). 2004. European Integration and Political Conflict: Citizens, Parties, Groups. Cambridge: Cambridge University Press, 280 pp. Europe has experienced the most radical reallocation of authority that has ever taken place in peacetime over the past half-century. The ideological conflicts emerging from this development are only now becoming apparent. This collection brings together an authoritative group of scholars of European and comparative politics to investigate patterns of conflict arising in the European Union. The contributors to the volume conclude that political contestation concerning European integration is rooted in the basic conflicts that have shaped political life in Western Europe for many years. Liesbet Hooghe and Gary Marks. 2001. Multi-Level Governance and European Integration. Lanham, M.D. : Rowman & Littlefield, XVI + 240pp. European politics has been reshaped in recent decades by a dual process of centralization and decentralization. At the same time that authority in many policy areas has shifted to the supranational level of the European Union, so national governments have given subnational regions within countries more say over the lives of their citizens. At the forefront of scholars who characterize this dual process as multi-level governance, Liesbet Hooghe and Gary Marks argue that its emergence in the second half of the twentieth century is a watershed in the political development of Europe. Hooghe and Marks explain why multi-level governance has taken place and how it shapes conflict in national and European political arenas. Drawing on a rich body of original research, the book is at the same time written in a clear and accessible style for undergraduates and non-experts. Seymour Martin Lipset and Gary Marks. 2000. 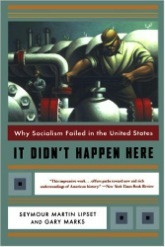 It Didn’t Happen Here: Why Socialism Failed in the United States? with Seymour Martin Lipset (New York: Norton), 379 pp. Why socialism has failed to play a significant role in the United States―the most developed capitalist industrial society and hence, ostensibly, fertile ground for socialism―has been a critical question of American history and political development. Seymour Martin Lipset and Gary Marks “survey with subtlety and shrewd judgment the various explanations” (Wall Street Journal) for this phenomenon of American political exceptionalism. “Clearly written, intelligent, filled with new information” (Times Literary Supplement), this “splendidly convincing” (Michael Kazin, Georgetown University) work eschews conventional arguments about socialism’s demise to present a fuller understanding of how multiple factors―political structure, American values, immigration, and the split between the Socialist party and mainstream unions―combined to seal socialism’s fate. “In peak form, two master political sociologists offer a must-read synthesis.”―Theda Skocpol, Harvard University. Herbert Kitschelt, Peter Lange, Gary Marks, and John D. Stephens. 1999. Continuity and Change in Contemporary Capitalism. Cambridge University Press: Cambridge, 527 pp. Capitalist democracies have always displayed considerable diversity in their key political and economic institutions, such as the organization of economic interest groups and private enterprises, the public sector and the welfare state, as well as political parties and social movements. This book asks whether the challenges of new technologies, citizens’ preferences, and growing political and economic interdependence in the 1980s and 1990s force all polities to adopt similar institutional reforms. The authors argue that established arrangements have become difficult to sustain, but that countries choose unique trajectories of reform, not a common approach. The diversity among capitalist democracies persists in a new fashion. Gary Marks, Fritz Scharpf, Philippe Schmitter, and Wolfgang Streeck. 1996. Governance in the European Union. London: Sage Press, 182 pp. 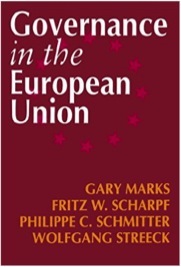 This book presents a fresh alternative to traditional state-centered analyses of the process of European integration. Leading experts analyze the state in terms of its component parts and show the interaction of subnational, national and supranational actors in the emerging European polity. This “multi-level politics’ approach offers a powerful lens through which to view the future course of European integration. Gary Marks. 1989. 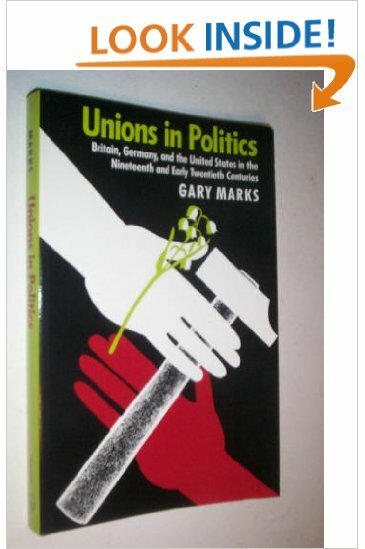 Unions in Politics: Britain, Germany, and the United States in the Nineteenth and Early Twentieth Centuries. Princeton: Princeton University Press, 277 pp. This book combines the tools of political science, sociology, and labor history to offer a wide-ranging analysis of how unions have participated in politics in Britain, Germany, and the United States. Rather than focus exclusively on national union federations, Gary Marks investigates variations among individual unions both within and across these countries. By examining the individual unions that make up union movements, he probes beyond national descriptions of British laborism, German socialism, and American business unionism while bringing the analysis closer to the actual experiences of people who joined labor organizations. Marks examines state repression of unions, the Organizational Revolution, the contrasting experiences of printing and coalmining unions, and American Exceptionalism.